I got 2 disk drives in my t3500 (came with it, guess it was also used for copying disks). Anyway, was looking initially at a hotswappable 5.25 but didn't need it. Now I got another issue is the fan noise. The 80mm fans I got is stupid loud cause it is running max speed. They are PWM 4 pin fans but they do not use the small dell connectors. Does anyone know of an adapter that would work? Cause this is annoying the noise. To plug your 4 pin fan into the dell 5 pin controller slot? That's the cooler for the 2nd CPU on the T5500 optional riser card. The primary cooler is the same as the T3500. Here's the Dell fan pinout. Alright, so fresh install, everything up, here we go. Any suggestions on what to do now? I would like to overclock with throttlestop but I don't really know how to use it and I have already gone through the thread. Use the TRL and TPL tabs...one of them sets the multiplier(s) based on amount of cores loaded...and the other limits power usage. I just set the power usage thing on some really high number as to not get any throttling...I can dig out the numbers I used, but I don't think it makes much of a difference as long as you set them high enough. I got a freaking message on boot of my T5500 saying :"non ECC ram are not supported ..". I shut down and disconnect everything. The message disappeared on next boot. Is it the sign of coming failure? Dell T9303 heatpipe cooler, Delta GFB1212VHG 2 motor fan. If you could tell us what CPU(s) and what RAM you're running it would help. Do you have the latest BIOS from Dell? It will be difficult to upgrade the bios (no disk with a win7, and I didn't succeed to boot from a freedos key). If you dont have a free HDD to load windows 10 trial, on you could build a preinstallation environment (WinPE/RE)using the iso and boot from usb/cd. Also there usually is a dell bios boot iso (though i cant say for sure on t5500). I just used one to update my bios on my T610 and R810 series poweredges that run headless VMs. May also try building a YUMI boot disk. You should be able to build a dos boot from it. Ive found YUMI is my goto for stuff like this. Also i havnt tried it using the trial version but if you boot the windows install disk and enter ibto repair you shoukd be able to lauch a commandline, mount the volume with the dell buos and run from there....been a while since ive had to do something like that but there should be a way. That looks like a very old but correct configuration. The most likely reason would be a RAM module giving a POST error. This may be a sign of things to come. I would run some RAM stress test to see if that's it. They're up to BIOS A17 August 2018 "Urgent". This is the Spectre, Meltdown patch. So it might be worth the effort. Most of us here would give that system an update. Newer BIOS. X5687 3.6Ghz 32nm 4C/8T, or X5670 or up 6C/12T. 8GB DDR3 1333 RDIMM ECC are $30 each new. The faster memory goes with the faster CPU in these. If you can find a RAM problem that would be a cheap fix. But the RAM controller is on the CPU so another reason to look into that option. Would you jump directly from A02 to A17? Since you're still runnning that old configuration I asume it's working for you. The 80W CPU probably came with the aluminum heatsink. With a newer BIOS there are plenty of 4 core, and 6 core 80W options in the newer 32nm CPU family other than the 130W chips many of us prefer. Any of the 5000 series Xeons should work. Safe bet would probaly be a couple steps. Maybe A07,A11,A17. That has been an issue sometimes. Maybe wait until some of the others reply. A GTX 960 will definitely outrun that CPU. The 3 channel RAM can keep up just fine. That's basically a slow Core2 Quad with Hyperthreading and 3 channel RAM added. The Spectre patch has a performance hit attached to it also. They had to disable some prefetch features for security. I would definitely suggest a lot more CPU clock speed. Since you're still runnning that old configuration I asume it's working for you. The 80W CPU probably came with the aluminum heatsink. You're right, this is it. With a newer BIOS there are plenty of 4 core, and 6 core 80W options in the newer 32nm CPU family other than the 130W chips many of us prefer. Any of the 5000 series Xeons should work. I understand that I do have to upgrade the bios before trying to upgrade the CPU. I jumped one T5500 from A6 to A17 a few weeks back with no issues. 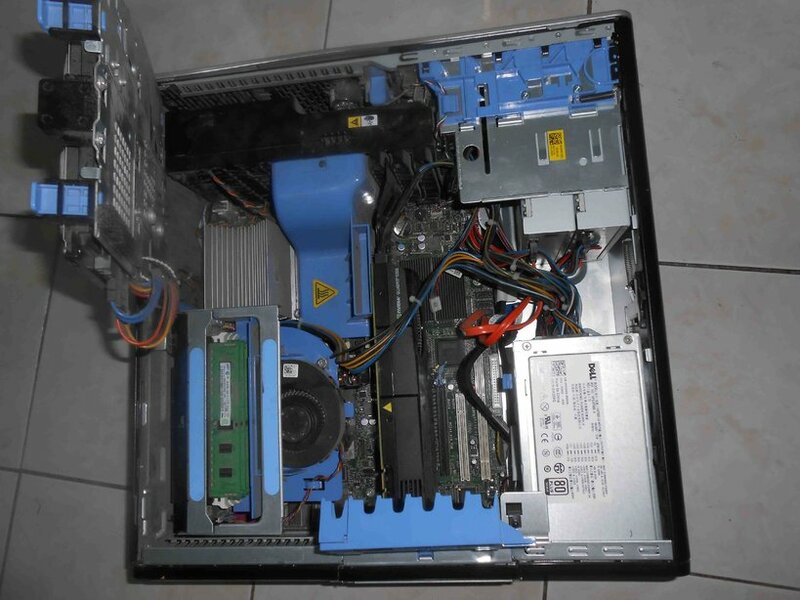 It had the old case that has non-removable HDD0 bay. I was getting an error with my X5687s and 24gb DDR-10600R ECC ram that dimm 2 was bad. I ran the update and boom ram came back just fine. I would run A16 or A17 for all hardware support. Like Retro said though - if you are running VMs, the A17 BIOS came out in April to patch Specter v2, otherwise A16 is the same as far as hardware support. I personally dont like flashing bios that work because you dont know what you will end up with but A02 is super old and there have been a lot of fixes/support added since then. As a side note a pair of X5687s will go a long way towards improving your system performance. I just benched my T7500 (which the T5500 can be setup quite equally) - and it benched in the 79th percentile for both the system and GPU tests with a 1070ti...The processors alone came in at the top 91st percentile! Not too shabby, I'll run a test on my T5500 with 2x x5687s, 24gb a gtx 1060 card for comparison and post later. The only major differences are in the GPU (1060 vs 1070ti) and disks (I've spent a lot of time optimizing the T7500 as it s my main workstation). For reference the T5500 is running a single Intel SSD5 545s 256gb off the motherboard sata controller. The T7500 disk setup is in my signature. The T5500 could be setup identically though I dont know if there is enough room for all the disks lol. Either way the systems end up about equal when the parts are the same. I also just notices the 1060 (though 1 less star) scored 1000 points higher than the 1070ti on 3D??? I'll have to upgrade the T5500 to the latest version of 3DMark and run again...really wierd! The T5500 board I'm using to post this is same early model as yours - D883F. Went from BIOS 'A02' to 'A16' without issue. The utility will tell you if the upgrade is supported or not . A17 was not out yet. Just updated a few minutes ago. Dell utility makes it very easy. Not like the old days flashing from floppy in DOS. Recommend installing latest Intel chipset driver too. Seems they are often overlooked. Newest for T5500 is 'A06' ... 'A23' for T3500. Given that chipset is the I/O hub between CPU & RAM, and rest of the system (SATA, USB, PCI, etc ...) it makes sense to me to update for maximum compatability and optimization. U016F is the 130W cooler. Are you missing the blue plastic RAM shroud? It also keep air from going around the cooler. It's thicker. All Dell PSUs are. It allows a bigger fan in the front. The more Watts the longer they get. After that's sorted out. Dell makes the wires just the length they need to be for each system. But it's "100% modular" in that the whole harness comes off in one piece ( 100% as in all or nothing). They did use the 1.1KW in some big Alienware and XPS systems with Aftermarket compatible ATX motherboards. But that doesn't mean you won't find proprietary connectors for SLI or Crossfire adapters, or H2C Peltier coolers with light shows built in. The PSU itself is just fine. It's the harness that you need to get right. Best thing would be to measure your aftermarket system and see how the 1,100 watt unit fits. Dimensions are 6 inch x 4 inch x 9 inch. I believe the technical term for Dell units is "semi-modular". Wiring harness all one large connector. As opposed to "full modular" where they are separate and only connect ones needed. With that in mind, you will be bundling up a lot of wiring since the Dell harness has extra connectors you don't need. Second EPS for instance. Plus extra long SATA power, to name a few. Harnesses can be adjusted via using adapters like I have witnessed. So the Dell PSU's that are not proprietary 24pin and what not, are fine. Just make sure the wire guage on the feed and converter >= draw and pinouts are the same. For instance I wouldnt convert the SATA power ports, their wire guage is too small for most other peripherals. Also dont try an connect the cpu cable to a GPU as the pinouts are different. The t7500 power supply is nice though as it has separate electical busses so if you do know what you are doing, it can be very flexible/useful. Add 2" for the harness at one end. My EVGA 850 is Semi Modular. The 24 pin and a couple other wires are permanently attached. Extra CPU, and GPU can be added individually. But the aftermarkets concerns, and Dells concerns are entirely different. Dell workstation PSU are designed to be swapped out quickly without disturbing any other connections or components. Other than that you're on your own. Except for the smallest EPA low powered PSUs Dell used multiple bus designs. The 305W Optiplex PSU had 2-18A. 12V. rails. Yes it would actually produce 400W if you intentionally overloaded it on a test bench. Delll doesn't sell PSUs by the Watt. Their ratings are continuos, not peak power like most aftermarket. There are a lot of reasons to use them if you pay attention to what you're doing. I used the T7500 power supplies for powering my ASUS B250 mining rigs and can confirm they can handle beyond 1100w continuous in a 80F environment - 24x7x365. Before I optimized, I had one rig running about 3500w off 3x PSU, and one PSU meter showed a peak of around 1350w. I later optimized and ran the GPUs off breakout boards and HP gold rated PSUs, but the T7500 PSU did the work with no problems. I have replaced the PS in my T3500 with one from T5500 (875W). Sure, I had to take the MB out to route neatly the new harness, but it looks "factory".